Discover the final list of nominees and vote now for your favorite artists ! On January 22, 2011, TF1 and NRJ will organise the music event of the year : the 12th ceremony of the NRJ MUSIC AWARDS live from the MIDEM in Cannes. The NRJ MUSIC AWARDS ceremony is the only awards ceremony that is exclusively based on votes by the public. 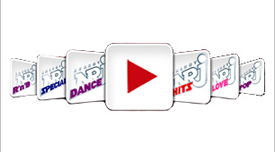 This year, in order to give more power than ever to the listeners and TV watchers and to reward the music they like, NRJ and TF1 proposed several evolutions in the voting process. From December 1st, for the first time, the list of nominees was open to internet users for votes. They were invited to choose the artists they wanted to nominate. Four nominees out of six were designated by the internet users in each category. From today and until January 16th included, the public can vote for their favorite artists/songs HERE. This year, in order for the winners to reflect as best as possible the public’s taste, people can only vote one time per day in each category. Regarding the « French Song of the Year », the nominees will be revealed to the public a few days before the show, the votes will be made exclusively by telephone and SMS during the ceremony. The thirteen trophies will be given to the artists on TF1 and NRJ on January 22nd at the occasion of the opening of the 45th edition of the MIDEM. As every year, the greatest French and international stars in the news in 2010 will come to Cannes on the NRJ MUSIC AWARDS stage, presented by Nikos Aliagas for the third year in a row. - And the favorite celebrity of the French, YANNICK NOAH ! NRJ invite you to vote for your favorite artists now HERE.